AutomotiveEC is a web-based EDI subscription service that provides suppliers with an easy-to-use and cost effective solution for processing EDI documents using a web browser and internet connection. 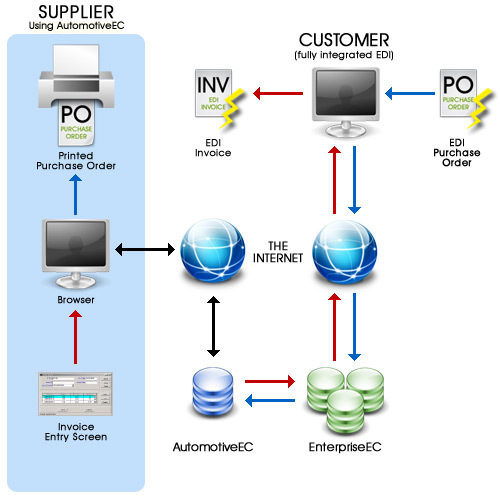 For inbound EDI documents, such as purchase orders, AutomotiveEC provides readable reports of the EDI data. For outbound documents, such as invoices, AutomotiveEC provides entry screens for rapidly creating EDI documents. Wherever possible, data from incoming documents or data stored in templates for recurring documents are pre-loaded into outbound documents eliminating much of the data entry required to create an EDI document. Small and Medium-size Suppliers - Our solutions are used by thousands of suppliers as their total EDI solution. Large Suppliers - AutomotiveEC is used by many companies to augment their existing EDI capabilities as a temporary solution while they integrate new transactions into their in-house systems or to process unique documents such as Advance Ship Notices. AutomotiveEC takes the complexity out of doing EDI by allowing subscribers to access and process business documents rather than EDI data. All connectivity to trading partners is handled by Edict Systems, regardless if they want to use a Value Added Network or peer-to-peer solutions such as EDIINT AS2. There is no software to download, install, and support and no "data mapping" to be accomplished. AutomotiveEC was designed to allow our customers to focus on their core business, not EDI issues.